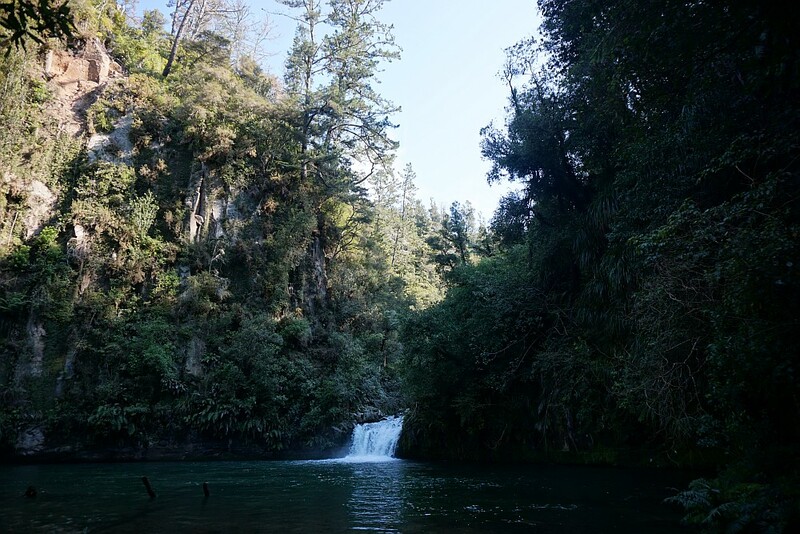 Raparapahoe Falls is a 3-metre high waterfall on the Raparapahoe Stream, plunging into a large pool at the bottom of a valley with very steep sides. 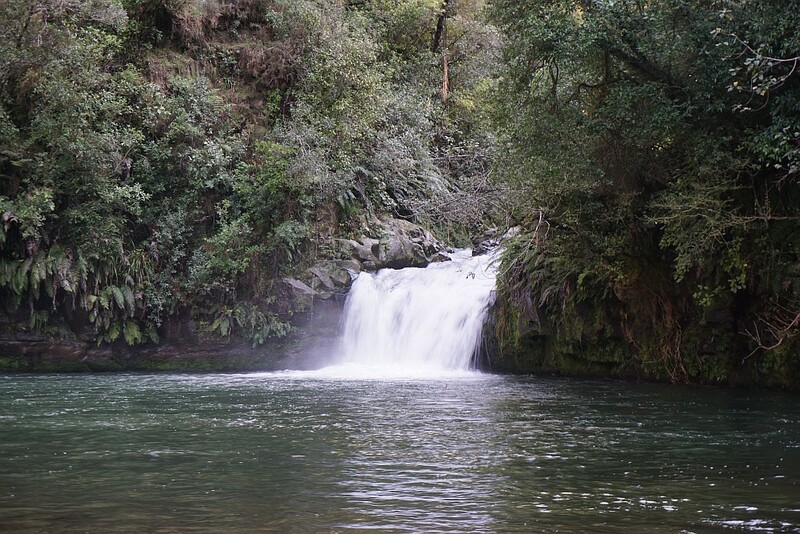 The stream and waterfall is accessible by a short but steep and rough track starting at a small parking area on No 4 Road near Te Puke. 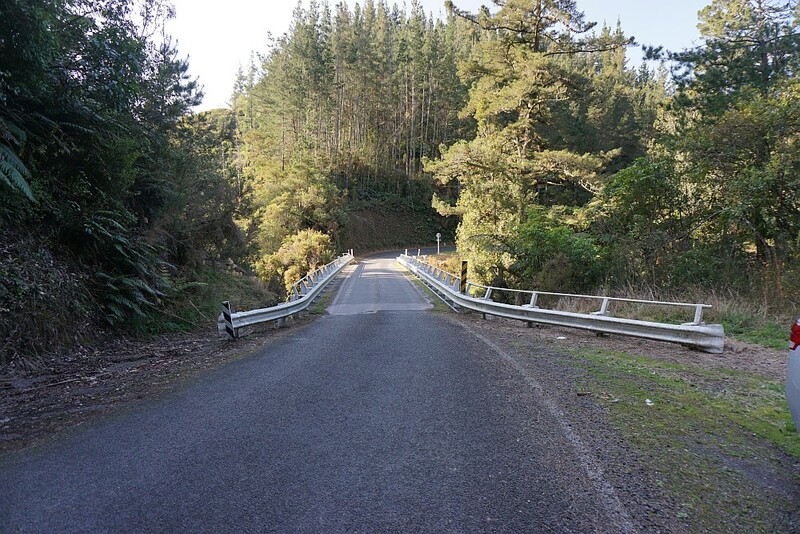 A narrow bridge on No 4 Road crosses over Raparapahoe Stream not far from No 3 Road, with the road continuing through mainly kiwifruit orchards to the parking area and track start. 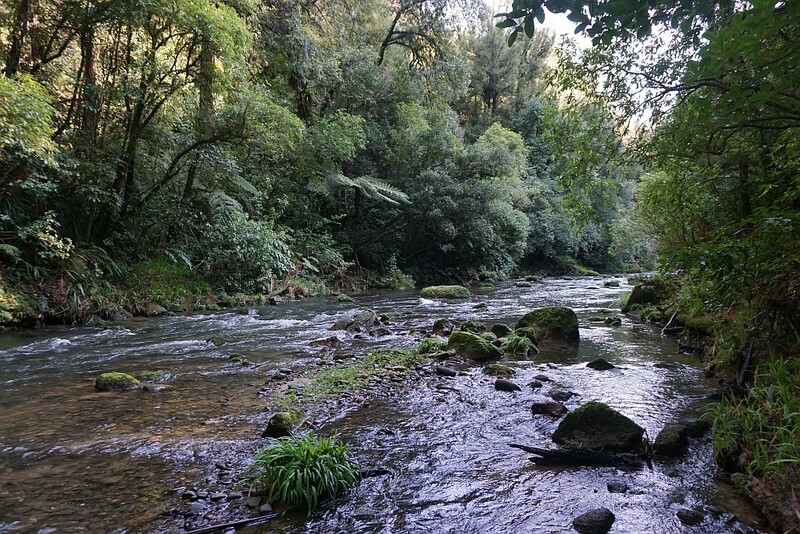 It continues on to another narrow bridge, crossing over Wairapukao Stream, a tributary to Raparapahoe Stream. 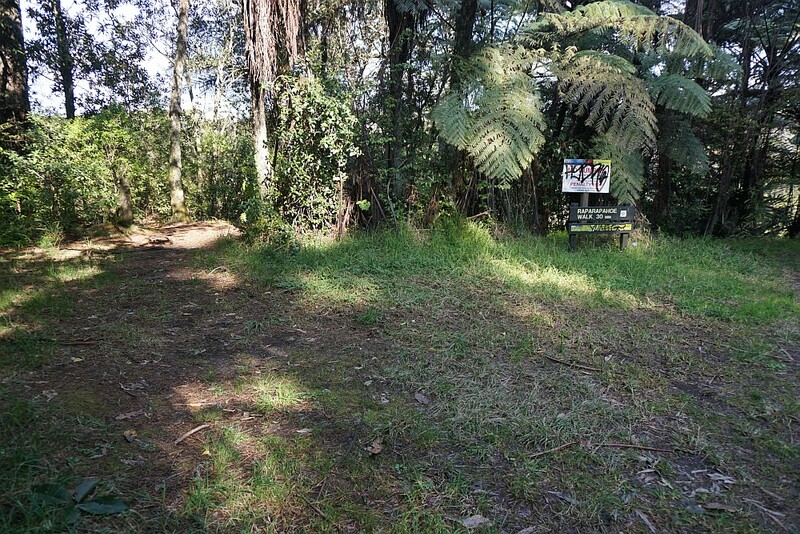 There are no facilities at the parking area, and the signs for the walk are usually covered in graffiti. 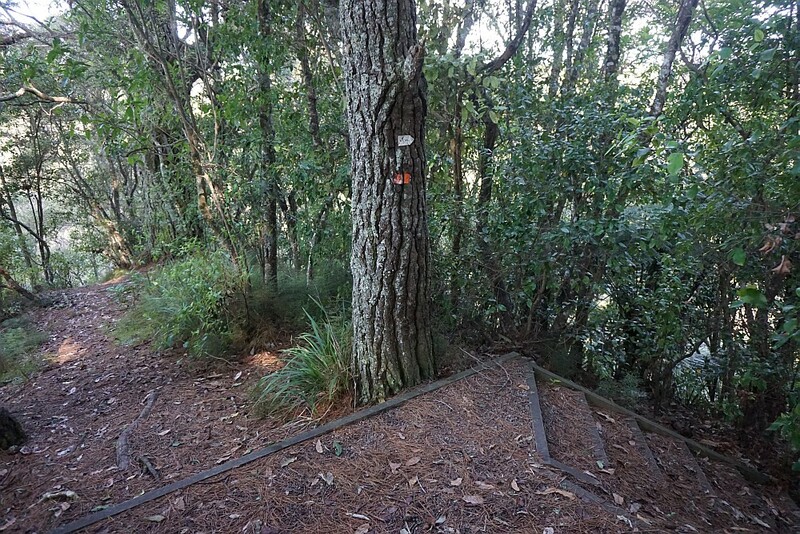 The total track length is less than one kilometre, but is steep and rough in places. It zig-zags down the steep valley face from the carpark to the stream, with some steps along the way. Total time from the parking area and back was less than one hour. 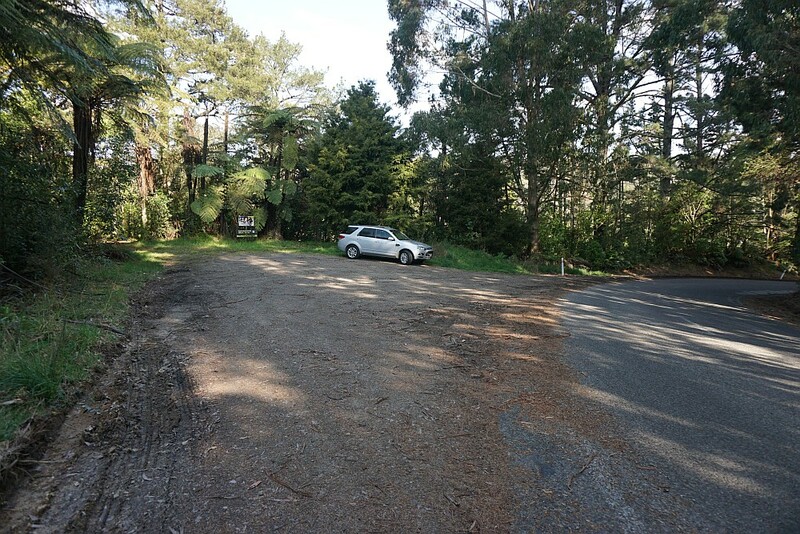 The parking area on No 4 Road. The track starts to the left of the signs behind the vehicle. The graffitied signs, indicating a walking time of 30 minutes. The track starts to the left of the picture. Not far from the start the track branches off to the right, or continues straight ahead to the left. The two parts join a short way further down the hillside. 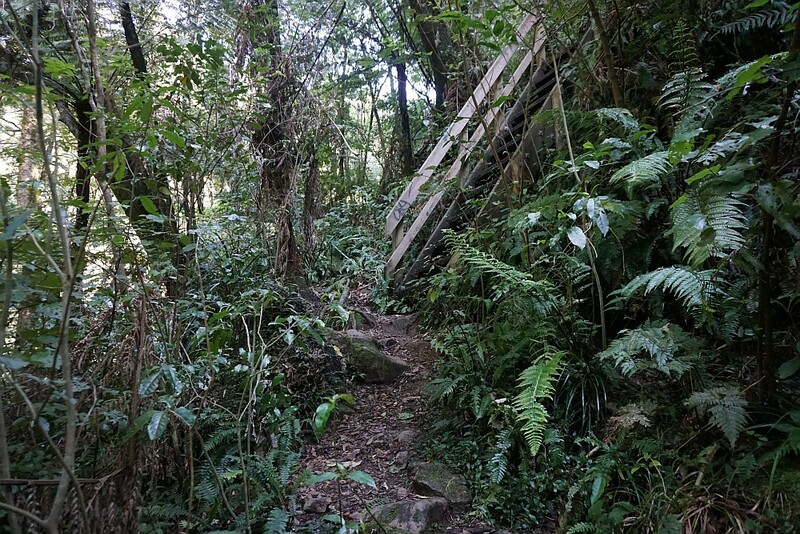 The branch to the right is longer but not as steep. There are steps on some of the steeper sections of the track. 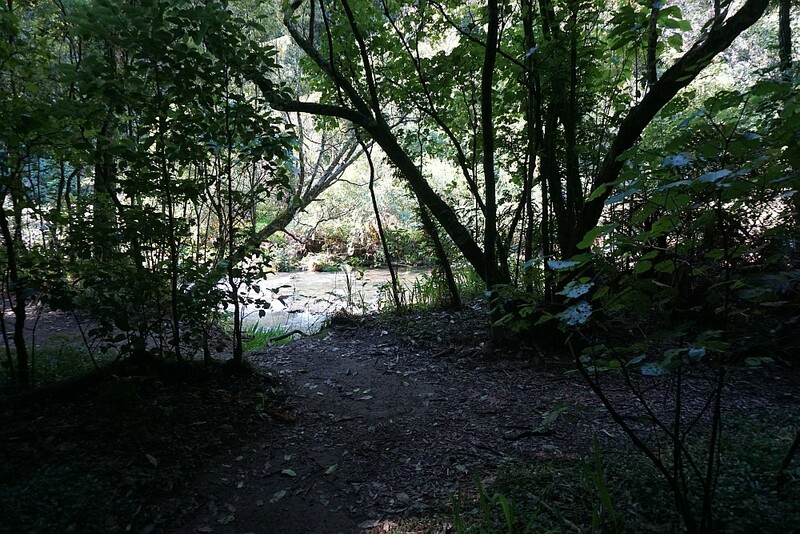 The last part of the track before reaching the river bank is a gentle contour. A branch to the left follows the river downstream for a short distance. The branch to the right leads to the waterfall. Looking downstream by the branch in the track. Some track markers have been there for some years. 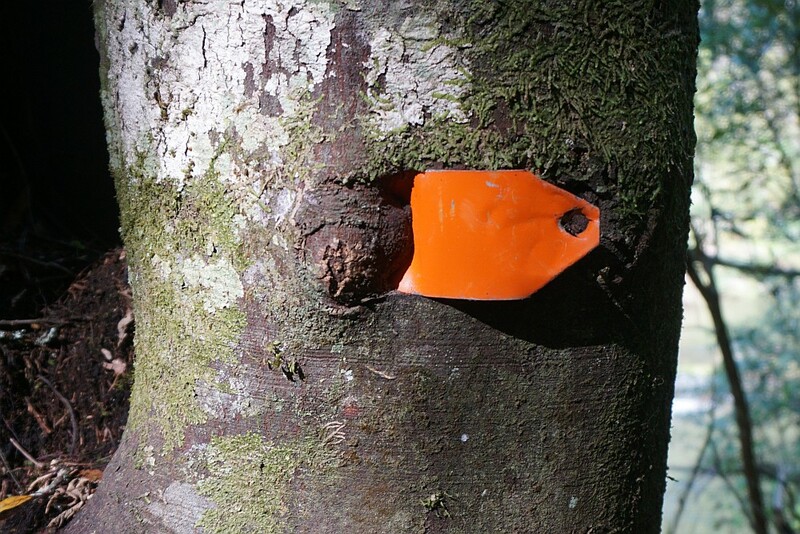 This one is completely embedded in the tree at one end. 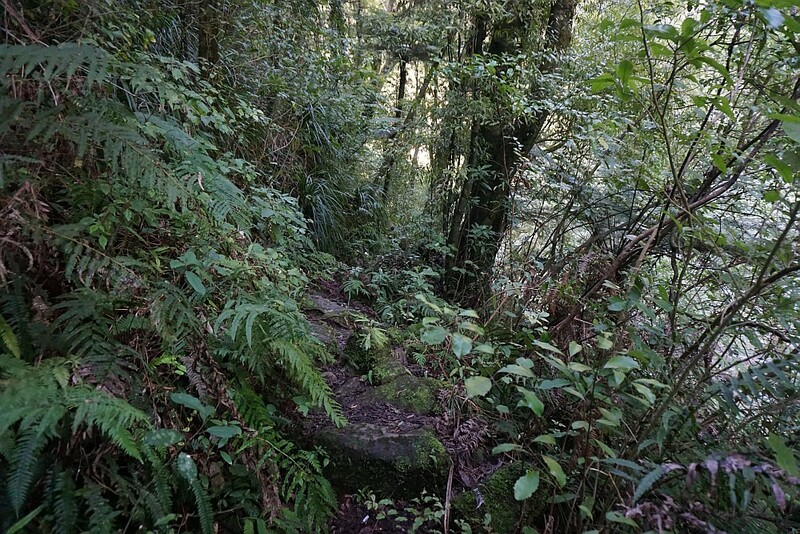 The track to the waterfall is narrow and rough in places, with steep dropoffs down to the stream. Raparapahoe Falls and the pool below the falls. The valley walls are near vertical. 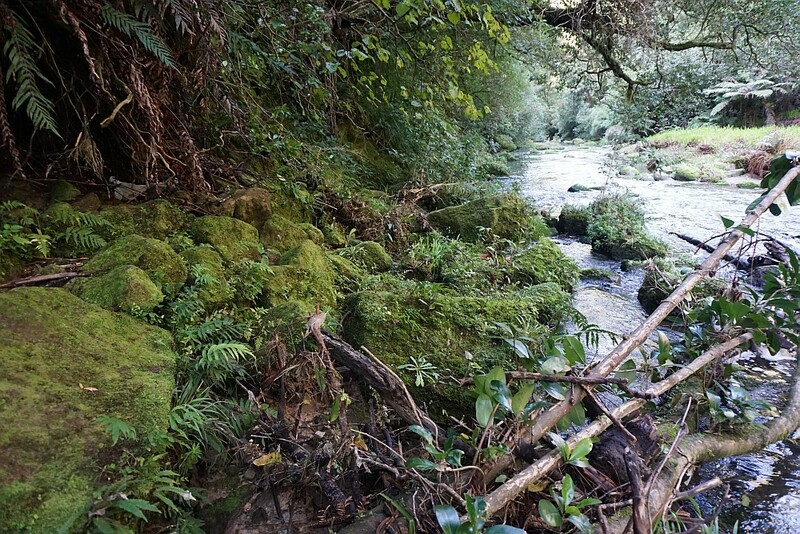 Looking downstream from the plunge pool, over moss-covered rocks. Looking upstream, on the way back to the track leading up to the parking area. The bridge on No 4 Road crossing the Wairapukao Stream. 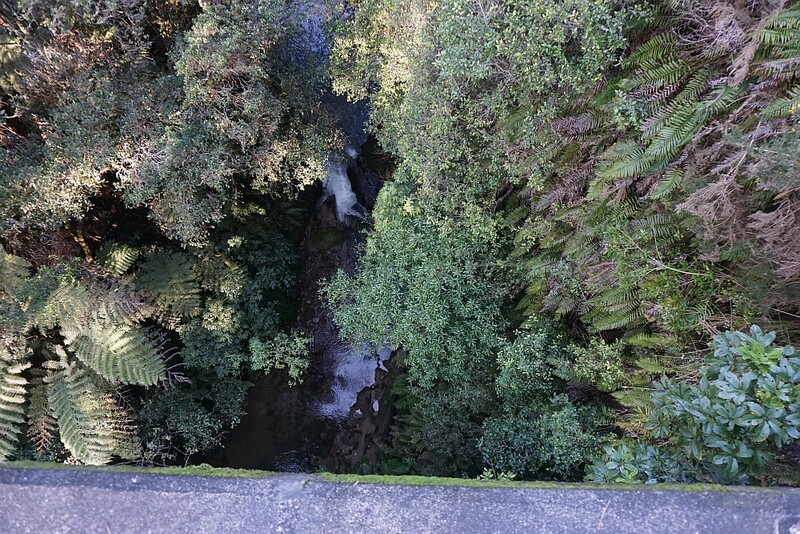 Looking down from the bridge to the stream, probably about 20 metres below and almost hidden by vegetation. The total distance walked was almost 2 kilometres. 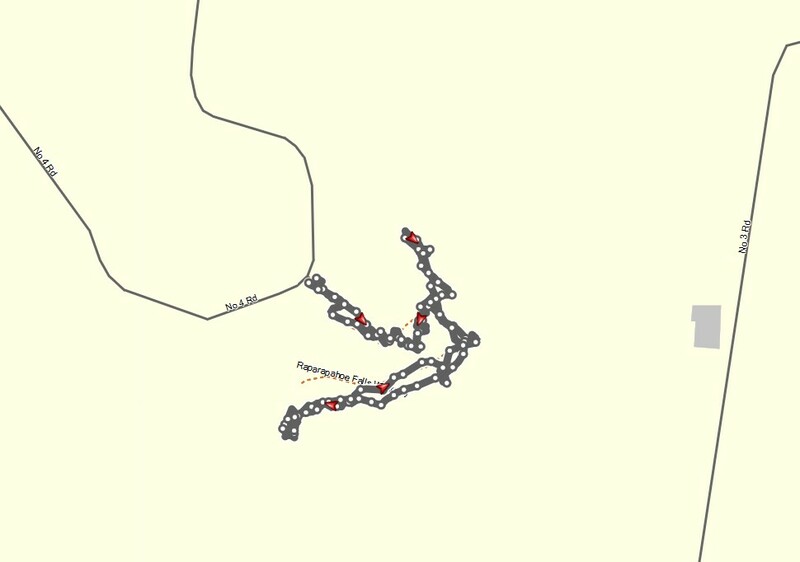 The GPS tracklog shows the approximate track walked. Due to the deep valley and steep valley faces the satellite signals were insufficient for accurate location. The falls are at the lower left end of the track. Total time for the walk was 55 minutes. 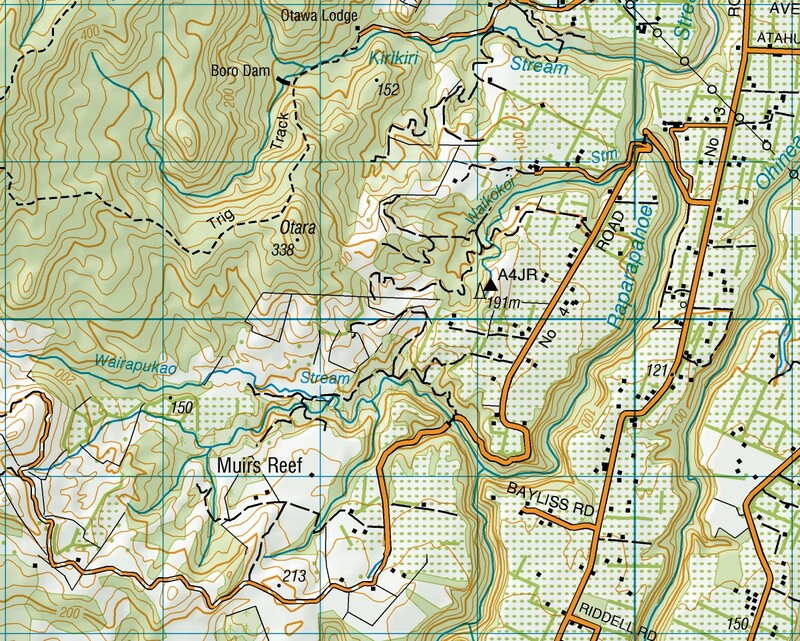 A topographic map excerpt does not show the location of the track or of fhe falls. The falls are in the stream just above the B in BAYLISS. The track was walked on August 21, 2015. 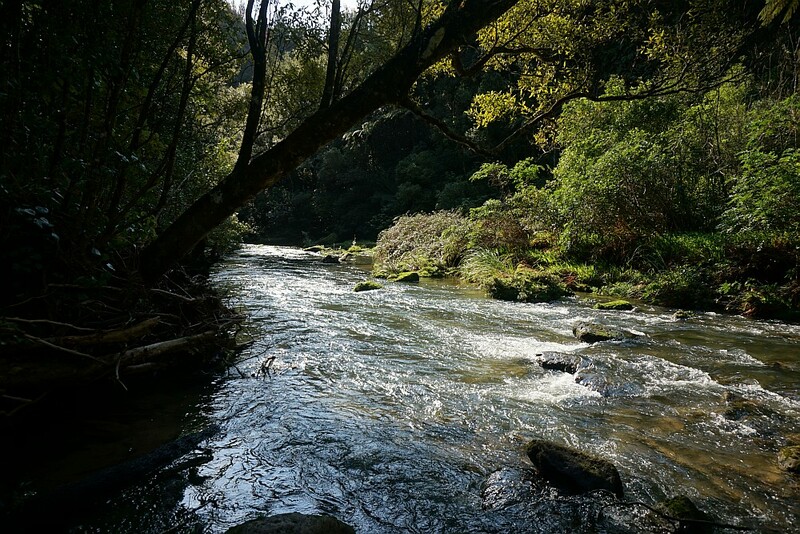 This entry was posted in Walks and tagged Raparapahoe Falls, Raparapahoe Stream, Te Puke on 2015-08-21 by nzartig.